0 Comments Published by KL Ocs Kid on Tuesday, May 26, 2009 at 11:35 AM. Liverpool defender Sami Hyypia says he will be leaving behind a club that has improved dramatically in the last 10 years when he joins Bayer Leverkusen. The 35-year-old leaves Anfield this summer after a successful decade in which he has won numerous trophies, including the Champions League in 2005. "It is hard to take in now. It is nice to be remembered here." Hyypia, who joined Liverpool from Dutch side Willem II in 1999 for £2.5m, is expected to make his 464th appearance for Liverpool in their final game of the season, at home to Tottenham on Sunday. He certainly deserves legendary status and he is definitely one of the best players I have ever played alongside. As well as the Champions League, the former club captain has also won the Uefa Cup during his time on Merseyside, as well winning the European Super Cup in 2001 and 2005, the FA Cup in 2001 and 2006 and League Cup in 2001 and 2003. However, Hyypia admits he will leave the club regretting that was never part of a Premier League-winning side - and he reflected on this season where they came agonisingly close to dethroning Manchester United. "The only thing that bothers me is that I will leave Liverpool without a Premier League medal, that disappoints me as much for the fans but the club will do it soon," he said. "This season has shown that we can push any team right to the end. Everything looks very bright for next season, and hopefully the team can move their confidence up another level." The Finland international also stated a desire to return to Liverpool in a coaching capacity in the future, something current Reds boss Rafa Benitez would encourage. Big Sami will be sorely missed. I so hope he comes back as a coach after his two years in the Bundesliga. "I would like to come back to Liverpool one day as a coach, and it was great to hear the manager would like me to return. "At the end of my playing career I will look to take the badges and then see (what happens). I have so many memories of Liverpool, and really would love to return one day." 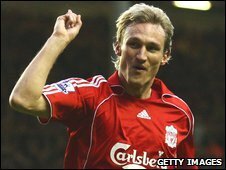 Benitez revealed that he had tried to keep Hyypia on a player-coach contract beyond the end of this season. "Sami is so important that we talked about him becoming a member of the coaching staff in the future," he said. "But he thought he could play more and wants to be involved in the first team. "The fact that we were talking to him about becoming a coach shows how much we think of him, he is a perfect professional. Steven Gerrard, who took over the Liverpool captaincy from Hyypia, also praised the central defender. "It's difficult to put into words how we feel about Sami. He's been fantastic for us, a colossus," said Gerrard. "He certainly deserves legendary status and he is definitely one of the best players I have ever played alongside."